stickboybike: ...and the band played on, Ball of Confusion, that's what the world is today, hey hey! ...and the band played on, Ball of Confusion, that's what the world is today, hey hey! So far so good on the road in Virgina/Maryland/DC. I swung through some of my accounts yesterday on the way to my destination of the Eastern Shore. I was leaving my visit around 3:30pm when the weather went bad really quick. I mean QUICK! I was throwing my T-Cube into the back of the Subaru and the weather changed over to apocalyptic. Green skies, hard rain, winds blowing small children down the sidewalk...ok maybe not that bad but I was expecting to see Yul Brenner in a red robe with his arms out to the side or something. It turns out that a few miles from me a tornado had touched down and slapped a portion of the town around. The rain was filling up the streets rapidly, visibility at 30mph was almost impossible. All I can say is thank goodness for Subaru's all wheel drive. It makes the junk weather more tolerable at highway speeds. Route 50 heading to the shore was littered with cars that had spun off the road in the rain. A huge tree had fallen along the road wiping out a power line and ended up blocking a portion of the highway. Nuts! The following morning I rolled out to my local dealer who is setting up a meet and greet tent at the local Tri event this weekend. Later in the afternoon the owner's son and I had met up with some local cyclists for a spin through the land. The Eastern Shore is FLAT! And with a wicked headwind too. 12 knots or something? 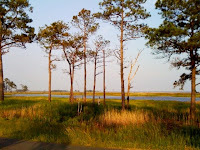 The ride was beautiful as it rolled through the Blackwater Wildlife Refuge. This wasn't the best shot as it was facing the sun but the landscape was serene so I took it anyway. The resolution on the pix are average, shot them with my iPhone. This is facing the East. The water isn't the best in the region. It's a mix of fresh and salt water. 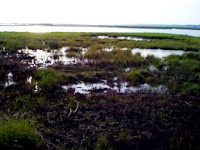 I believe that is a tad brackish? Along the route, the puller of the pack had a to point out the usual features to steer clear of . Down here it was 2 snapping turtles, doh! A good change from the road apples of the Amish Country that I ride around back home. I dropped the owner's son off at home and headed back to the hotel to settle in for the evening. Being on the road makes it tough to eat well. 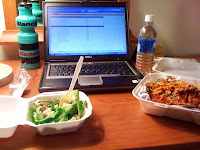 As you can see in the photo above, I visited the Italian Diner across the street from the hotel. My plans for the evening included emails, orders, inventory reorg and trying to make a dent in a 7 pound container of Eggplant Parm. I better keep riding or I'll be a chubby rep, ugh! Half that Parm will be breakfast tomorrow, right?